A fabulous range of acrylic paints. I am not sure why they call them inks but I call them paints - it confuses people. There are 28 glorious colours in 60ml jars plus 5 interference colours (called Interferons.These are wonderful worked on black surfaces for an alchemy effect) However people are scared of interference paints because they look white and they don't know what to do with them. Try them on black - believe me the result is wonderful. The paint can be used on textiles, paper, wood, glass, ceramics & leather. I find them to be very rich and lush as use them as an exquisite, rich embellishment for paper and fabric surfaces. You can see the mica in them. Stamp, stencil or handpaint. Use as a foil adhesive, and as an embossing ink on silk/rayon velvet. Colours are easy to mix and being translucent, can be layered. Warm hand wash no hotter than 40C. What this means is that I iron them with a hot iron or use my heat gun. But note that I rarely wash my work. These paints I see as very special occasion paints - they are lush and a little goes along way. I don't just brush them on - I also decant them into spray bottles (make sure you clear out the nozzle after you have used them as the mica will clog the spray) and use them as a wash but I also use them as is for rich and luscious effects. They are like your best red shoes. These are the four newest colours - Angelique - Guava - Najah - Tamasin - and I usually lift the paint out with a tiny plastic spoon (thanks Qantas) onto a polystyrene tray and roll with a sponge roller onto my stamps or through stencils etc. I might spray the surface with water and then brush over but not usually. It is just the way that I work. This is the Spectrum range of 12 - you can see the mica - such gloriousness - here I did in fact brush this paint onto polycotton. 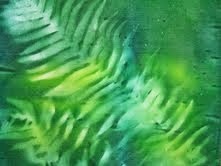 and here I have used a sponge roller through a stencil - the Sunburst stencil and over the lot I have sprayed a watered down version. My basket of sprays. There is no measurement of how much paint and how much water - just what takes my fancy. You can be as precise as you like. Then to finish it off I have sponged Isis through a stencil - X's from Artistcellar. These are our newest paints - shimmery lustrous opaque metallic fabric paints - not as rich as the Oplulence but wonderful for every day wear. These water based paints are perfect for any of your creative work. They have good colour fastness and are suitable for hand painting onto cotton and poly/cotton fabric (and of course Tissutex). They have the consistency of thickened cream but can also be diluted (and sprayed) or thickened. They work very well through thermofax screens. Heat fix to set. Machine washable. The paints leaves a soft hand on the fabric. Suitable for all types of application – brushwork, stencilling, screen printing spraying etc. Come in 100ml plastic bottles with useful flip top lids. They come in lovely little flip top lids which makes them easy to use and once again I squeeze some onto a polystyrene tray to use. You can also see that they are dirty already. Tut tut. They look like lollipops but fortunately are non-fattening. The name Gems tells it all. This sample was just me using my fingers direct from the bottles (that is why they are rather dirty) and wiping the paint onto Evolon. over the top I have worked a little through a tiny stencil. See the richness at the bottom where the i -phone has picked it up. a little colour chart just to show the colour range. and two pieces of polycotton just cleaning the brushes. So easy to use. Sun Dye paints do just that - you can use them for sun printing - as you can with many other paints. A good range range of sun sensitive paints but also great for fabric painting on cotton and silk and everything else you can think of - like Tissutex (another of my mega favourite surfaces for colour and stitch). They come in 130ml jars but of course I like to decant them and then spray colour on the surface. Again, because they are acrylic, make sure you clean the nozzles after use so that they don't clog up and frustrate you not being able to spray clearly. This is an example of sun painting - so easy peasy. Colour your surface - lay masks on and pop your work out in the sun - or under the lights in your studio. Wonderful results. As an extra - add a little Sun Pearl or Sun Gold to your paint to create a pearlescent finish. The Sun Dye Fabric Paints work very well on surfaces like Fusible Webbing (Vliesofix - Wonderunder - Bondaweb). Spray your webbing with water and then brush the paint on. I have used Chamomile, Citrus and Flame. 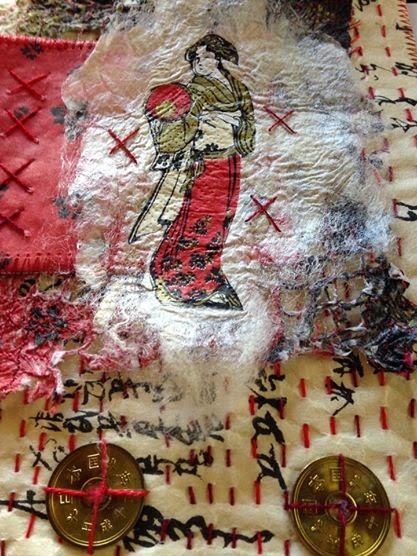 When it is dry, lift off the paper backing and apply to another surface using your iron (under baking parchment to protect your iron) and then there are all sorts of other possibilities. Here I have foiled onto polycotton and sprayed Sun Dye fabric paint over the top for a great effect. Texcraft Dual Purpose Fabric Paint is a high quality paint for handpainting or pigment dyeing fabric. This paint is similar (in my mind) to Sun Dye but it is thicker and very easy to simply paint on. I haven't decanted it yet but I love using it direct onto surfaces. It is so easy to use. I think it complements the other paint by giving added flexibility. You can also thicken it for printing. The paints are water based and contain softeners that improve the handling softness of the fabric and assist in fabric penetration when applied. Suitable for cotton and polycotton and Evolon and Tissutex (of course). Heat to fix. As well as 30 ordinary colours, there are 8 fluoro colours and 4 metallics. I hope this has demysitfied the range for you - and of course I hope you might try them. They are all intermixable. Check them out on our website and note too, that we have special offers when you buy a few. I love using them and I must add that they clean up well too! Coffee is always on the books when you go away although I really do prefer it at home when made by Ian - he should just take his machine with him every trip. However shows we were relaxing and doing nothing. We had a very nice meal at Puttina Trattoria in Woolhara - great little restaurant. Grant cooked a bbq the first night - very good. 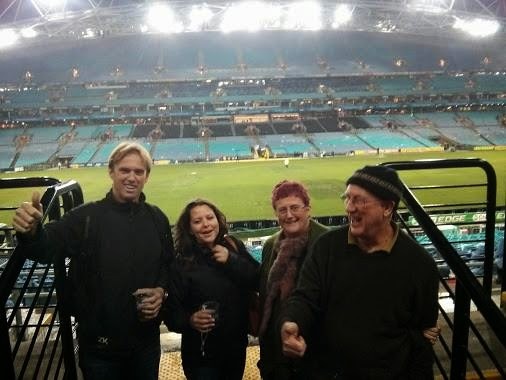 Sat night we went to the rugby - what a dour game. A draw and so many silly ref decisions. We spent all day worryinga bout getting wet because Grant was told our seats were in the open - and it surely did rain - so we were very relieved to be under cover. Didn't improve the game though. Sunday we went to the Botanical Gardens - loads of beautiful tulips in flower - Spring is a coming. Checked these out on our wandering as well. This week since we got back has been very busy but I did manage to get my article finished - playing with a Japanese theme. You will have to buy Embellish to see more! And of course yesterday was the second Bledisloe rugby game in Auckland with a wonderful result. Today we are busy doing whatever it is that we are doing - tomorrow morning we are off to Broome very early to finalise the Broome Retreat. Read about it here http://www.thethreadstudio.com/catalogue/broome/broomeleft.pdf - hopefully everything will be sorted - we will be busy rushing around sorting things out and maybe having a swim or two - I might even take my little piece from above and finish it off. We thought our stand looked good this year - well it always does but seemed so well set out this year - I did leave stuff at home for a change.... We got our van on Monday night and filled it up doing two deliveries on Wed and then managed to set everything up on Thursday after a leisurely breakfast and out by 6pm to a leisurely meal with not too much to do before the doors opened on Friday at 9.30am. Here is the lovely Debbie behind the servery - we have fabulous staff at the show who slip in and work well - Lisa came on Saturday and was a great addition to the clan. Here is Jaslyn in charge of all the surrounds - see the magazines? Practically nothing left at the end. The stencil stands making their yearly appearance - 4 stands both sides and still not enough space for them all. The stencils were a huge winner - we have sold out of heaps and many only have 1 or 2 left. Never fear - there is a new lot of new ones on way pretty soon. This was my demo area - all the paints and stamps and sprays and textile art stuff. Celia Player was our wonderful guest artist - many years ago in Alice Springs I met Celia at Forum and did a workshop with her - Celia is an artist who draws so well - and stitches from her drawings. She ran a two day class after the show which I am sure everyone enjoyed. More about art and drawing than just playing with techniques. Old school does well. Caroline Sharkey was a guest of the show with her wonderful landscapes. Caroline is so full of energy and was whizzing up stuff at a rapid rate. Doubt if she ever sleeps. Caroline is one of the tutors at our Broome Artistic Retreat in August 2015. More of that coming in a short while. Watch our website for details as soon as we are ready to roll. You will love her class and hopefully Jacinta's and mine! The lovely Ali George brought the SAQA exhibition to the show - we were privileged to have it first in Australia. Plus Ali was demonstrating and I know she sold out of her beautiful hand dyed fabrics on day 1. We hope she returns next year as it is a real pleasure to see her. In fact she was whispering tome about something special in the activity line at the show for 2015. There were lots of great exhibitions - I always forget to take photos - and I thought a good balance of retail stands this year. I did quite a bit of demoing off and on - mostly playing with the different paints I use. I had a lot of requests for what I use and how I use so as soon as I get a few moments I will write another blog entry on the different paints I love to play with and how. I played with my Gelli plate - this was one of our polymer stamps which promptly sold out. and finally I hung my World of Colour entry on the wall as a work in progress and took it down at night to further stitch. It is nearly finished and will be on its way hopefully by Friday. After the show with the help of Jaslyn, Oliver, Marion and Gray we were out of the venue in 1 hour - emptied the cars but left the van until Monday. Now I am working my way through the boxes gently unpacking, counting, sorting, reordering and all that stuff. We sold a lot of stuff I have observed. Thank you to everyone who came to the show and took home lovely goodies to add to their stashes. It was great to see you and we love you all.